Art is more than a career for Ghaith Salman Jarew – it is his calling. If his artistic fate had not been sealed at birth when he became the newest member of a creative family of artists, it certainly was when he picked up a paint brush at the young age of six and felt the sensation of destiny as he held the brush between his fingers. Immediately, the paintbrush seemed like an extension of himself, and he knew that art would forever be a central part of his life. Ten years later, while his fellow sixteen year olds were immersed in the typical experiences of adolescence, he was already painting professionally and building a name for himself in the Middle Eastern artistic sphere. 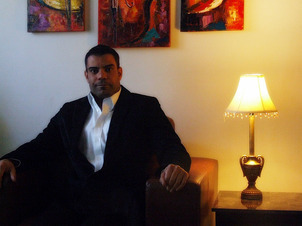 In 2001, he graduated from a prestigious Fine Arts Academy and his reputation as an artist continued to grow, his renown stemming from his two art galleries in Baghdad. He was also well known in artistic circles for his unique technique of mixing painting materials on the same canvas. In 2004, a calamitous upheaval forced Ghaith and his wife to flee from their native country of Iraq to Jordan, where he was fortunately able to continue selling his artwork. In December of 2012, he and his wife resettled in the United States. As he boarded the plane for his flight to America, he not only waved goodbye to the land that he grew up on, to the friends and family whom he loved, and to the familiarity of his own culture and language, but he also had to say goodbye to his widely revered reputation as an artist. Now in Chicago, Ghaith S. Jarew, a man who had achieved artistic fame in the Middle East, has been forced to start over. Ghaith’s story is a familiar one for many refugees who have resettled here in Chicago. Before relocating to the United States, many refugees formerly had been professionals who possessed esteemed degrees and respected positions in their home countries. Some were doctors, others carpenters, others teachers. However, when war, terror, or persecution turned their worlds inside-out, these refugees had to flee in order to survive. Once they arrive here in Chicago, refugees are determined to rebuild their shattered lives. They work with RefugeeOne staff to learn English and go through the Job Readiness and Placement Services program so that they are prepared to apply for, interview and work at a new job. However, they must take any job they can get in order to sustain themselves and their families, often settling into low-skilled, low-paying jobs outside of their areas of expertise. Like Ghaith, they must start over, their hard work and professional careers in their home countries relegated to the past. Most refugees do not dwell on the losses of their pasts, believing that resettlement in the United States offers them a chance to achieve bright futures. RefugeeOne seeks to provide refugees with the tools they need to build new lives of safety, dignity, and self-reliance. Stories like Ghaith’s reaffirm our mission as a refugee resettlement agency. Ghaith’s future looks bright, for he has not forgotten his calling. In his spare time he is working to build a name for himself as an artist here in Chicago, and his determined pursuit of an artistic career is an inspiration to us all.